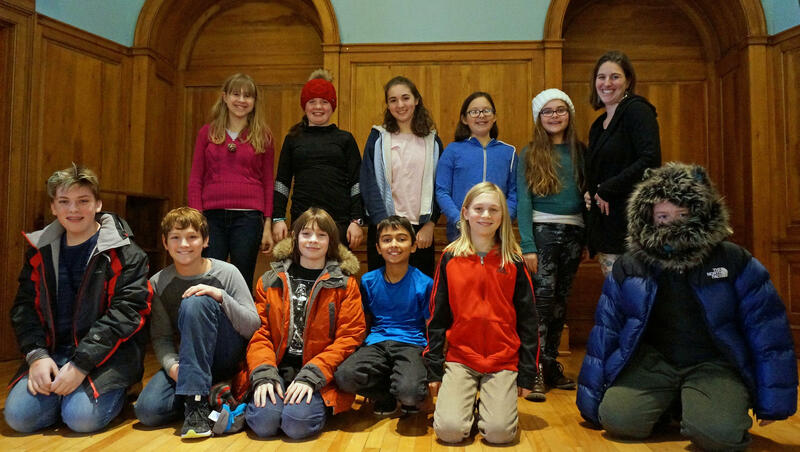 The Vermont Commons School sixth-graders show off their best Robin Hood poses. They've been reading the first installment of the Roybn Hoodlum Adventures series, inspired by the classic tale. As you might have guessed, the series is inspired by the stories of Robin Hood. But the Robyn in author Kekla Magoon's story lives in the dystopian futuristic Nott City. It's a far cry from Nottingham, England. The students settle into a rectangle of tables and chairs that are the only furnishings in the echoey old meeting hall. For this installment of Dorothy's List, we asked them to think of questions for the book’s author, and then we put those questions to Magoon. Emmett Cline Lucey: How did you come up with the idea for basing it off of the original Robin Hood myth? Kekla Magoon: I’ve always really liked Robin Hood as a character. I’ve liked Robin Hood stories. I like the idea of Robin Hood, where he’s kind of an outlaw. He’s mischievous, but he has a good heart and he’s actually trying to help people in the process. So I sort of like that line between doing what’s right and following the rules. And so Robin Hood really plays with that line between what you’re told is right and what you know in your heart, and what the laws are versus what is really kind and generous ... And so I hope that Robin Hood can be an inspiration to people to kind of push boundaries and try to find ways to help each other and support each other. Sophie Richardson-Shepherd wants to know more about the author’s motivation to write three books about this character. 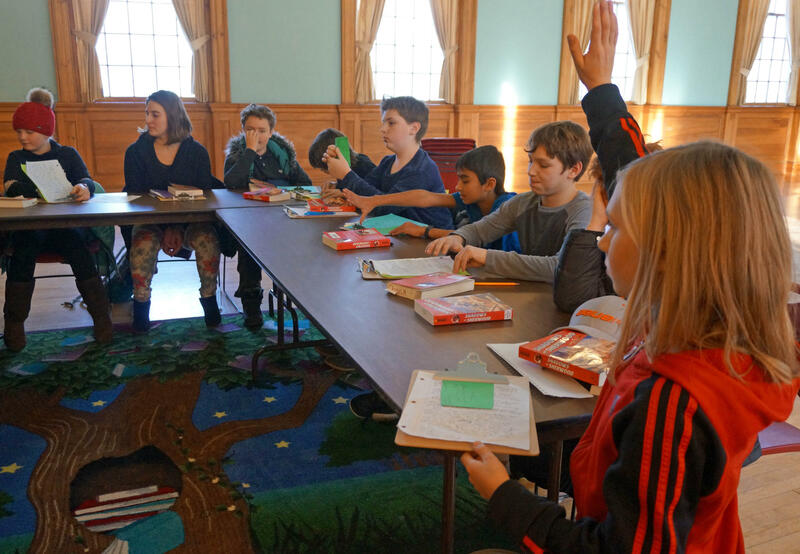 Sixth-graders from the Vermont Commons School, in South Burlington, took a bus ride down the road to Shelburne to meet at Pierson Library. Sophie Richardson-Shepherd: What gave you the inspiration for the Robyn Hoodlum series? Kekla Magoon: I grew up watching the Disney version of Robin Hood, where Robin Hood and Maid Marian are foxes. It’s a musical and there are lots of other animals in the story, and I really loved that movie … And so, as an adult, I have written a lot of pretty serious books. I write books about the civil rights movement. I write books about race relations in the United States and about the history of black people in the United States. And sometimes those books are really serious and heavy and they’re important to me. But it can be tiring, sometimes, to write about very serious things all the time. So I thought I wanted to write something more fun and lighthearted and that’s when my mind reminded me of what I liked when I was a kid, and so I decided, ‘I’m going to write a story about Robin Hood. But I’m going to reimagine her as a biracial teenage girl living in a city.’ So, not the white man outlaw from England of the old stories, but a new version of Robin Hood for the 21st century. But Magoon discovered that lighthearted story from her childhood had some familiar themes. Kekla Magoon: I realized in the process of working on Robyn that even though I thought this was going to be a fun, lighthearted story that was different from everything I usually write, it’s actually based on the same concepts of social justice and making sure that everybody has what they need and taking care of each other and your community. And that’s a lot of what I write about all the time. In Shadows of Sherwood, Robyn’s parents are kidnapped – and possibly killed – by an authoritarian governor looking to become an autocratic ruler. Robyn joins forces with some other kids who have been left to fend for themselves. And together they decide to redistribute the government’s stockpiles to people living in a homeless encampment. Or, if you like, they take from the rich to give to the poor. Sound familiar? Robyn’s dad has left her a series of clues to help her solve the mystery of what is happening as her world tightens around her. Some of it is prophesied in what they call the moon lore, which is filled with imagery of shadows and light. One piece of the puzzle that Robyn’s dad leaves behind is an old map. Back at the Pierson Library, Anouk Von Bernewitz thought it was pretty realistic. 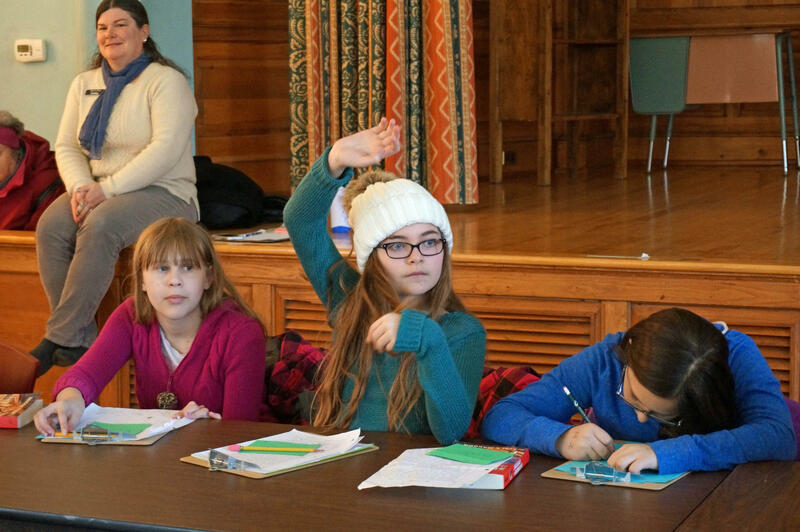 Anouk Von Bernewitz, center, raises her hand to chime in on the book discussion as classmates Kayla Stern, left, and Sophie Richardson-Shepherd, right, listen in. Library volunteer Cathy Townshend observes from the edge of the town hall stage. Anouk Von Bernewitz: Is the map of the city based off of somewhere that you’ve been in your life? Because that map was very detailed and had certain places like the tree house and the Loxley Manor, and I was just wondering if that was based off of anything you’ve seen in real life. Kekla Magoon: The map in the story is something that I made up and it’s not based on any real place in the real world. It’s based on my imagination of what Robyn’s world looks like. But here’s a secret that readers of Shadows of Sherwood might not realize about that map. Kekla Magoon: So if you look at where everything is placed on the map in the book, you can see that some of the most important places on the map kind of form a triangle. There’s kind of an arrow pattern to it because there’s arrow symbolism in Robin Hood. And so as she goes through her adventures in the first book, the second book and then the third book, she starts putting together the different pieces about the way the city is laid out and the way that the different special locations on her map fit together and how they’re going to help her to fight the battle that she needs to fight. Magoon says even though the setting isn’t a real one, it’s still important to Robyn’s story. And Noah Macauley is looking for connections between real life and Robyn’s world. Noah Macauley: How does Shadows of Sherwood correspond, or have parallels, to your life? Kekla Magoon: There are a number of parallels, I think. I think the character of Robyn – first of all she is biracial … and that’s what my life is like. My mom is white and my dad is black. My dad’s from Cameroon, actually – from West Africa. And so part of the symbolism of Robin Hood is the idea of black and white coming together, and sort of bridging differences. And that’s something I feel is part of my life experience – of being biracial and seeing myself as partly white and partly black … And so Robyn has a bit of exploration of that through some of the clues that she gets as part of the moon lore, which is the faith tradition of her community. And those elements are sort of something that comes out of a part of who I am, even though it’s not the way those things manifest in our real world. It’s just a way of representing it in the story. The character Robyn really knows how to stir up trouble. Charlie Melamede wondered how closely Magoon modeled Robyn after herself. Charlie Melamede: We went on your website and it didn’t look like you were the mischievous type, but I was just curious about that. Kekla Magoon: It’s true. I was not a kid that was very mischievous. I was a kid who wished I was very mischievous. And so, I think Robyn is partly me in certain ways, she has certain parts of my personality. But she also has a lot of characteristics that I wish I had, or characteristics that I sort of tend toward, but that are not as strong in me as they are in Robyn ... Sometimes I’m a little bit brave, and so I made Robyn extremely brave. And sometimes I am a little bit acrobatic, and so I made Robyn extremely acrobatic. Actually, I’m a little bit more clumsy, so that might be me wishing that I was cooler in some of those ways. But a lot of it is about how I wish I could be, right? It’s a fantasy. It’s about somebody who’s stronger and braver and smarter and more clever and able to trick people and able to use her power in all these different ways. And I want to aspire to be more like Robyn in certain ways. And I think that she does draw inspiration from me – but not just from who I actually am, but who I would like to be. 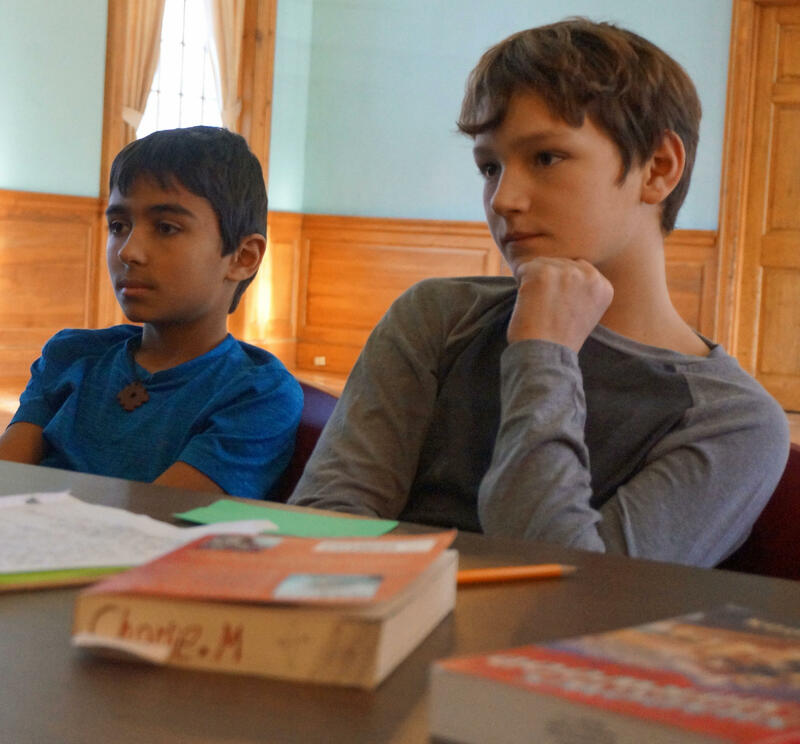 Anjay Mital-Skiff, left, and Charlie Melamede, right, take in the discussion. Anjay Mital-Skiff: I was wondering if you had any inspiration from the presidential campaign season when writing your book? Magoon said she could see where the readers might find some similarities, but the timing is off. Kekla Magoon: When I was writing the first book, Shadows of Sherwood, it was a long time before the election season of 2016. I was writing this book back in 2012 and 2013, and at that time I was thinking about not any specific political situation, either in this country or other countries around the world. I was thinking about a very broad picture of how people use and abuse power. And that’s a theme that has recurred over time and in all different parts of the world. I think that might be part of why Robin Hood is such an iconic story – why Robin Hood is a story that's very popular and keeps being told over and over again. Because in lots of different ways and lots of different places, there are situations where communities feel oppressed or communities feel like they’re struggling against the people that are in power. Many of these sixth-graders are looking forward to reading the next book in the Robyn Hoodlum series. Even though she didn’t draw inspiration from any current political situation, Magoon says the Robin Hood tales offer some timeless lessons that are applicable today. Kekla Magoon: And so Robin Hood’s story – both in Shadows of Sherwood, in my series, and Robin Hood’s story, historically – [has] been about how the people can exert their will against people in power. And how communities can fight for what’s right against people that do not necessarily have their best interest at heart. And so, I think that’s really important for us all to keep in mind – how we can be part of the political landscape, how we can make a difference. How we can fight for what we believe in and fight to take care of each other. And I think that that’s true regardless of what’s going on in the present political moment.